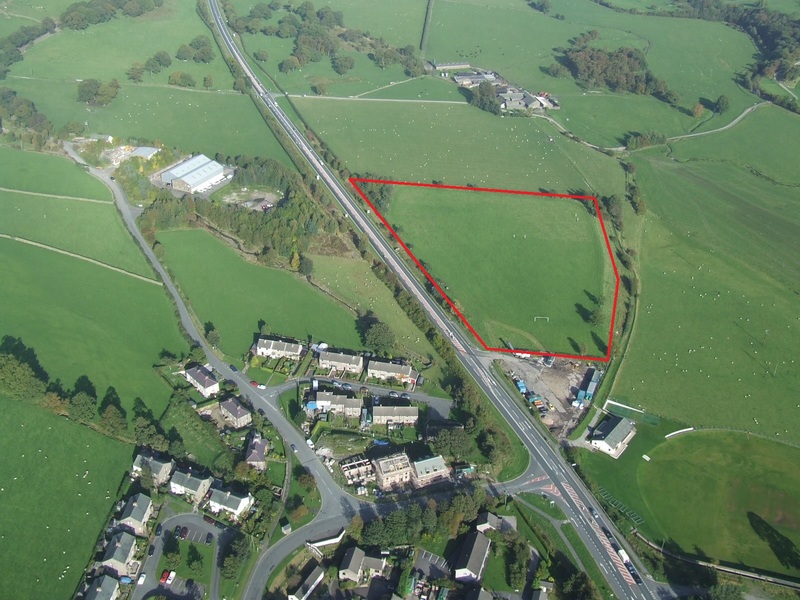 IMPORTANT - Restrictions on use No landing fields are available below the fell wall apart from the designated landing Field adjacent to the A66 (formerly known as the football field - DO NOT MIX THIS UP with the school games field in the centre of the village, which does have goalposts in it). Please put £1 in the honesty box if you are leaving your car in the car park next to the Landing Field (it's next to the car park entrance). An excellent and very demanding site. Blease Fell is a large grass covered mountain that rises up from the Glenderaterra Beck on to the west and Threlkeld to the south. 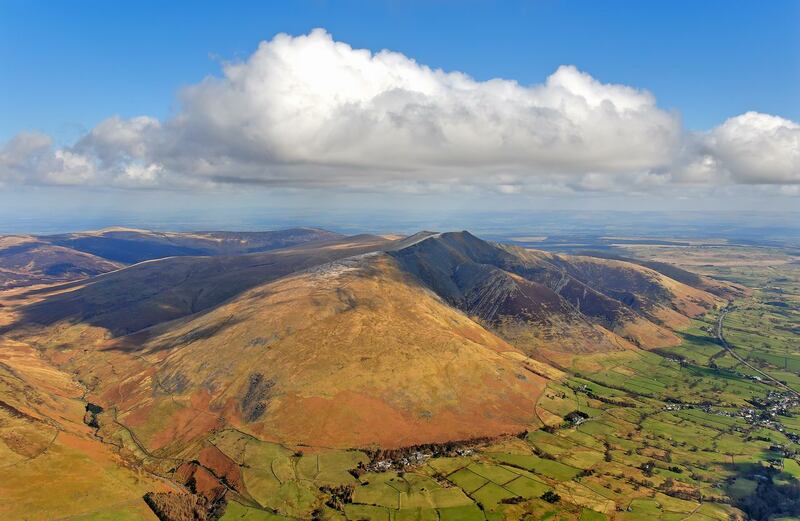 The site is notorious for generating massive lift and once airborne there is the possibility of soaring the whole Blencathra range and jumping across the gap to Jenkin Hill and then onto Skiddaw. The lift often extends well in front of the hill and it is not uncommon to have to fly out past the A66(T) before finding sink. Hangliders: A tough carry. Recommended landing in one of the large empty fields south of the A66(T). 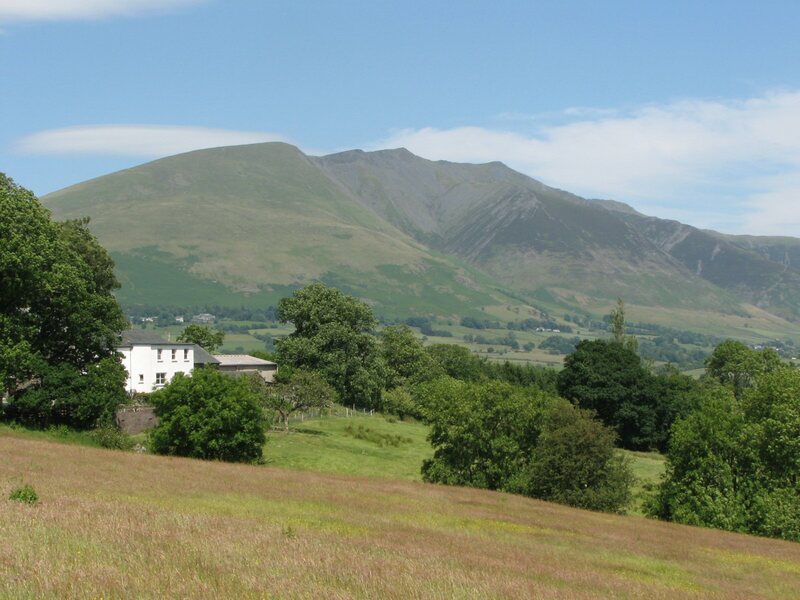 Approach by exiting the A66(T) at Threlkeld and proceed up through the village taking the steep road north towards the Blencathra Centre. Park in the car park at the end of the road just above and beyond the centre. The parking area can become very busy. If car sharing and leaving a car at the bottom, please put £1 in the honesty box if you are leaving your car in the car park next to the Landing Field (it's next to the car park entrance). It is a steep carry up the path from the car park until you clear the bracken line. The slope then eases and then leads to large areas to take off from. Extreme care must be taken on breezy days as being blown back is not an option! 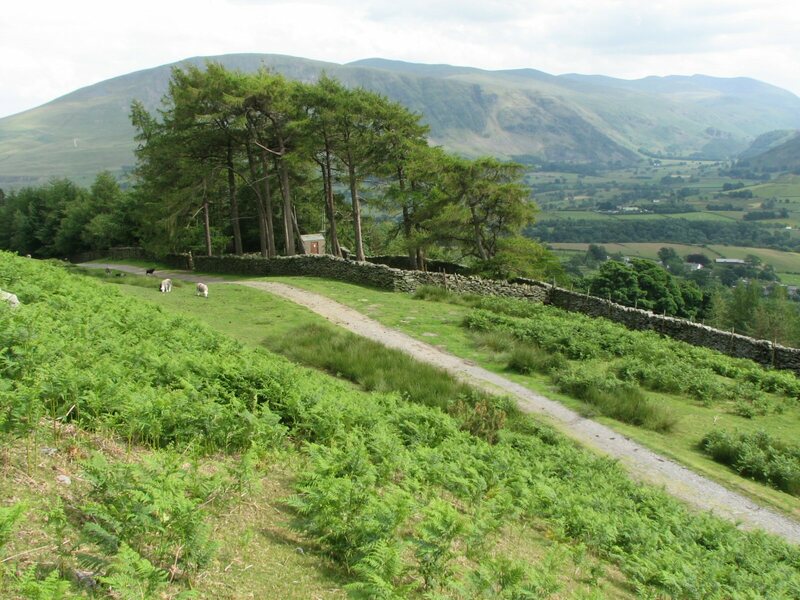 If the wind turns more markedly East or West take great care in the gulleys along the Blencathra massif. In certain conditions. a sea breeze can come from the Solway Firth (ie "over the back") and therefore flow down the hill. This is not what a pilot may expect, (as in this area the sea breeze usually arrives from a more westerly direction - along Bassenthwaite lake) Whilst this may be unusual, it renders the site dangerous. Keep vigilant. There are also powe rlines between take off and the designated landing field (it is a village!) - but these should not present a hazard as you won't be landing here! Speedwings are unlikely to be able to make the designated landing field - so this is not a great choice of site. Please do not land speedwings in other fields at the bottom, as this may jeopardise the use of one of our best sites. On a good day, you can take off on the large broad grassy shoulder. In light winds you may need to walk higher. Do not attempt to land on the small track leading north west out of the car park ( the "old landing area"). This is very demanding and it has been the source of many accidents. It used to be that landing was possible here but the greater performance of modern paragliders makes this much more of a challenge. Also the trees have grown considerably and can cause considerable turbulence. 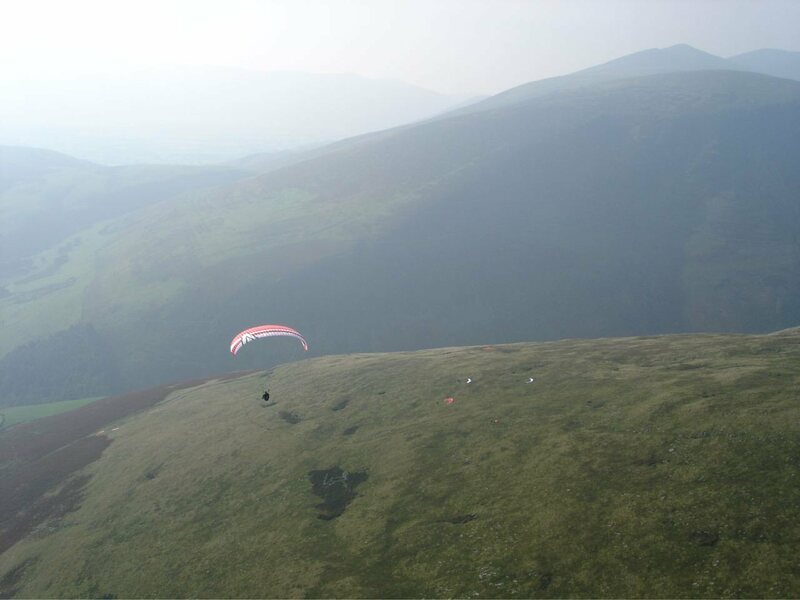 Please do not land below the fell wall unless you can land at the Threlkeld landing field adjacent to the A66 (the former football field) . It is shown as the landing field on the site map. Also refer to the photos section for more detail. Check you know which is the Landing Field before you take off (you may hear people refer to it as the Football Field - but the goalposts are long gone. Do not confuse it with the school playing field in the middle of the village which does have goal posts, but would be a VERY dangerous choice of landing). The landing field is closed in April when there are lambs and sheep here (sheep and lambs in other months of the year are OK). If the designated landing field is unavailable (rare), slope land above the bracken as there is no other agreed landing below the fell wall. "Top" landing is excellent on the large, broad, grassy shoulder. Probably the most demanding site in the North Lakes area. The flying and the lift generated can be very intimidating. It has been known for pilots to take off and spend the next hour in big ears before getting below take off. Pilots must be very comfortable in strong thermals and be confident at landing in the designated field. Excellent potential both downwind and, in the right conditions, for achieving large 'triangle' flights. 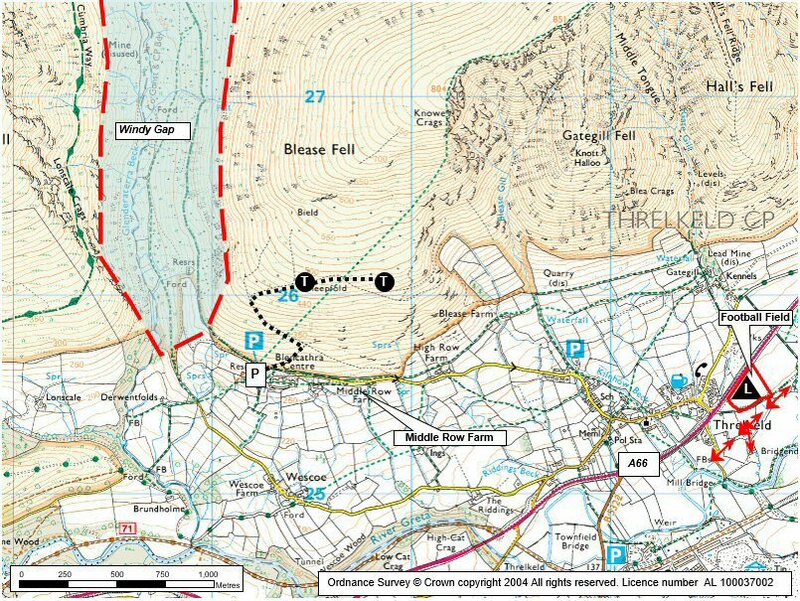 Take great care to keep well forward of windy gap if traversing west towards Skiddaw. An aerial view of Blease Fell looking NW. Take of is the area above the bracken line in the centre of the picture. Photo reproduced with the permission of the copyright owner, Andrew McMahon. More pictures can be found on his web site. A general view of Blencathra from SW. Blease Fell is the grassy western flank of the mountain, dominating the centre left of the photo. The football field (for landing) is clearly marked in this photo. Avoid landing in any other fields. Notes : A Jennings pub in Threkeld immediately below Blease Fell. The Treasurer reports that the food is excellent! (Oct 2010). Notes : A number of pilots completed this as an LCC task (this became briefly a National Declared Out and Return record). Notes : The flight that broke the 100km straight line record from a Cumbrian flying site. The flight took 3 hrs 20 mins from Blease to Crawford in the Clyde valley. Google Street View - Parking Google Street View doesn't go any further but you're almost there. Continue up the track on the right over a cattle grid. Parking can get busy.